For the first time in ages, I took my beloved steed Bunhongi (‘Pinkie’) out into the world. After brushing off an accumulation of dirt from Pinkie, who had been dormant at the bike rack by my house for well-nigh ‘three months and ten days,’ I hit the road. 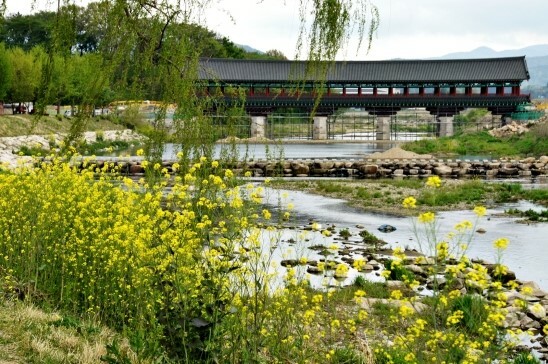 Following a loop, I started from the Gyeongju railway station, then went by way of the nice Hwangnyongsa ‘maru-gil’ wooden walkway to the banks of the Namcheon River overlooking the water that flows under the Woljeong-gyo covered bridge. 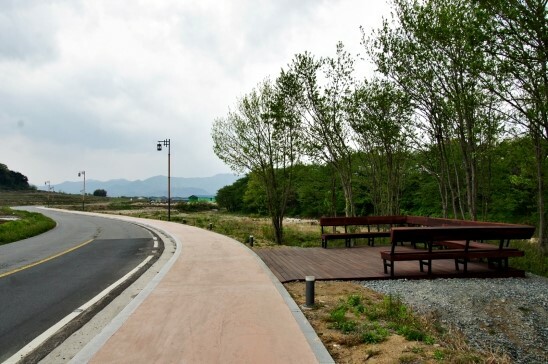 Traveling around the perimeter of Gyeongju proper, this bike course might take about half a day if done at a leisurely pace, taking rest breaks here and there at scenic spots. If you make haste and don’t stop for breaks, it would probably take only about three or four hours. As I rode, the wind blowing against my face was cool enough to cut through the muggy air, moist from the on-and-off rain. Although heavy clouds hung low in the sky, my heart was light as a feather, since it was time for an afternoon bike tour. Amid glorious waves of yellow rapeseed flowers, Bunhwangsa is an ardent temple with a burning passion for study. All this talk of ‘passion for study’ popped up as I sat on a bench inside Bunhwangsa Temple. 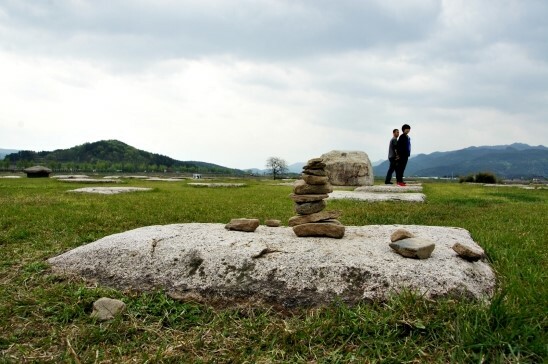 This is the story of a family from Seoul touring in Gyeongju. I arrived at Bunhwangsa Temple, after riding about ten minutes or so from the Gyeongju railway station. I was about to take a rest on a stone bench inside the Bunhwangsa Temple complex. Next to me, I saw a family in the midst of studying. Mom was devising quiz questions from information in a book, and the children were zealously searching for the answers, making a beeline for Bunhwangsa pagoda to check it out for themselves, accompanied by Dad. I was coveting the book the mom was holding, a volume on Gyeongju’s historic zones. Seeing how nicely information was presented in the book, I wanted a copy of my own so I could study, too. 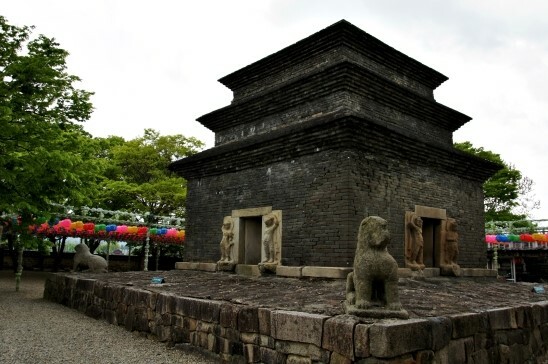 The Bunhwangsa pagoda, described in the book in two dimensions, was standing in 3D right here before a pair of children sightseeing at Bunhwangsa Temple on a family trip. Make a wish at Bunhwangsa Temple, where Heuimyeong, the mother of a blind child, once made a wish in Silla times, according to legend. 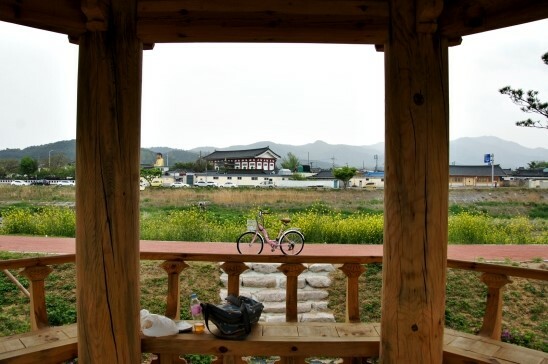 When leaving Bunhwangsa Temple, you may see a narrow unpaved trail right in front of you. 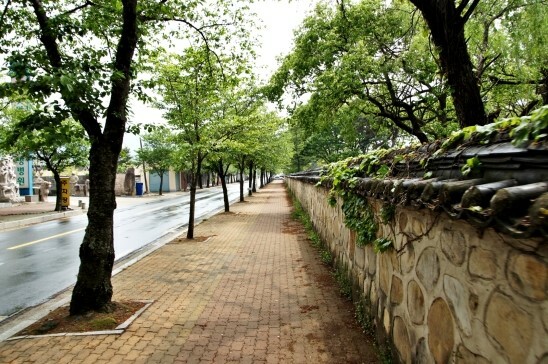 It’s the trail leading to the ancient site of Hwangnyongsa Temple. What appears to be a green pasture in the distance is actually the spot where the largest Buddhist temple of the Silla era once stood. Like Hwangnyongsa Temple, the history of Silla’s glory and honor ended with only the original site remaining. And from that ending, a path began. 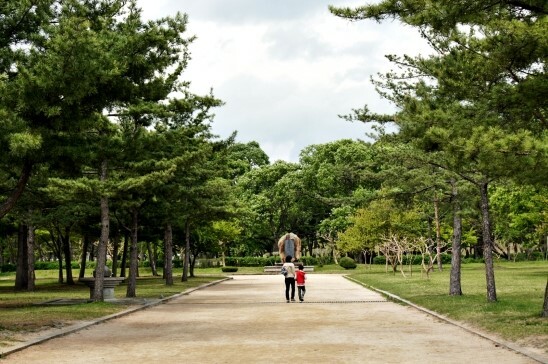 Before getting onto the Hwangnyongsa ‘maru-gil’ wooden walkway, try going across the ancient temple site. Someone has stacked up a six-tiered pagoda on the site of the legendary nine-tiered pagoda of Hwangnyongsa Temple. Before I left, I fixed it so it had nine tiers. If you follow the path laid between the site of the temple’s main hall and the spot where the nine-tiered pagoda once stood, you’ll come upon a kind of boardwalk that has been nicely constructed from wooden planks. 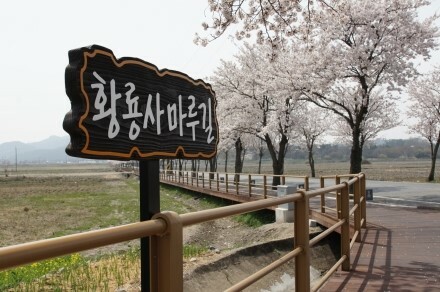 This is the Hwangnyongsa maru-gil, a wooden walkway that opened in January. As you head from Bunhwangsa Temple towards Anapji Pond (Wolji) and Daereungwon Tumuli Park, you’ll come to a four-way intersection. Starting from the terminus of Imhae-ro, the Hwangnyongsa maru-gil forms a wooden walkway leading to Gyeongju National Museum. Beyond the walkway, another very nice path passes beside the museum and continues to a spot just before the PR center for Woljeong-gyo bridge. This path is also great for walking and biking. 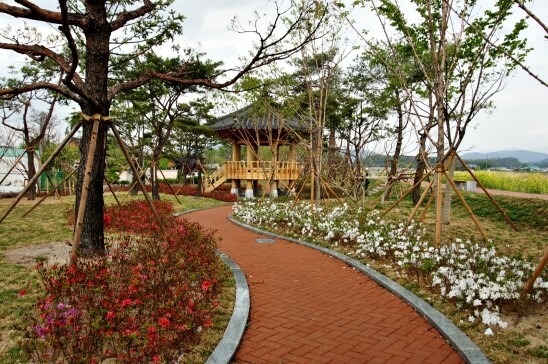 The pathway beside the Gyeongju National Museum is a continuation of the Hwangnyongsa maru-gil, and if you follow it, you’ll reach Woljeong-gyo bridge. At Woljeong-gyo bridge, I thought about crossing Gyochon-gyo bridge and heading towards Gyochon Village and Gyeongju Hyanggyo (a hyanggyo is a kind of school from the Goryeo and Joseon periods). I changed my mind, though, and decided to head along the Namcheon River to Oreung Royal Tombs Park. While having an exhilarating ride on this fantastic bike path, the merciless skies finally opened up and delivered the overdue rain. Just as I was seeking an escape from the rain, a little pavilion fortuitously appeared. I decided to rest there before moving on. 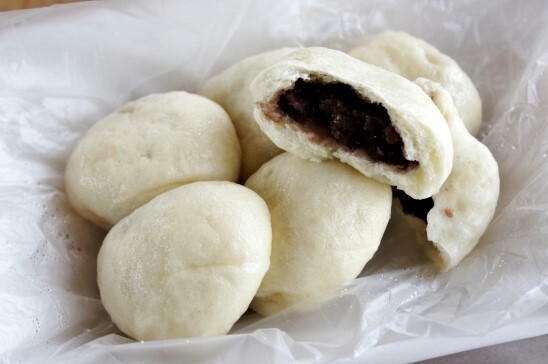 ‘Busan Jjinbbang’ steamed bun shop. I had stopped by the Busan Jinbbang shop earlier to buy a snack before heading for Bunhwangsa Temple. 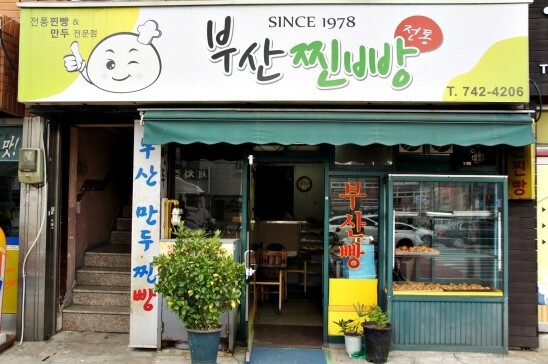 This shop is fairly well-known among Gyeongju residents, they say. I tasted their wares for the first time last year. 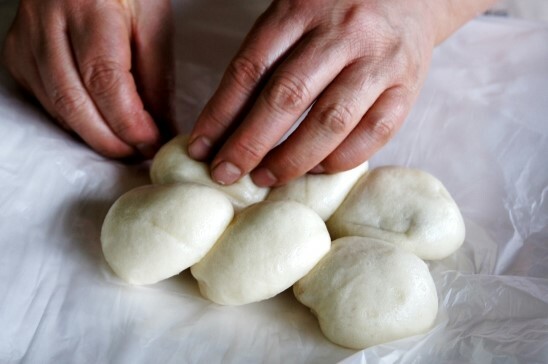 It’s nothing out of the ordinary, just steamed buns with sugar sprinkled on top, but I think about it from time to time. Weird, right? At six buns for 2,000 KRW (about $1.80 USD), the price is right. The buns ease my hunger, and keep me company during the tedium of waiting out the rain. 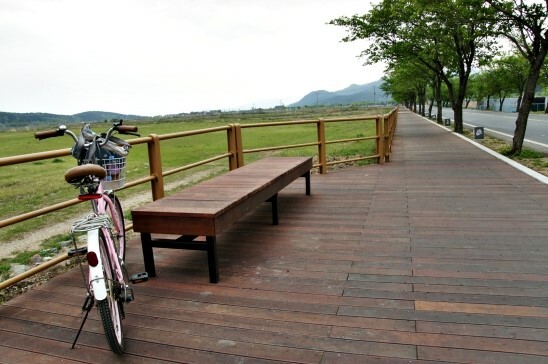 It’s only about 2-3 minutes by bike from the banks of the Namcheon River to Oreung Royal Tombs Park. It’s not very far, still within the city limits. The fickle weather has suddenly changed from a tumultuous fuss to peaceful skies, with the sun peeking out from between the clouds. As I head towards Oreung Royal Tombs Park, the bike feels light as air. Oreung Royal Tombs Park is fairly large. Bicycles are not permitted. 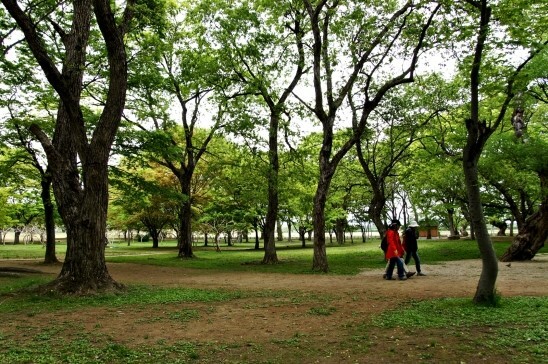 It’s a great place for a leisurely walk, and provided a good chance to rest my leg muscles, on fire from all the pedaling. 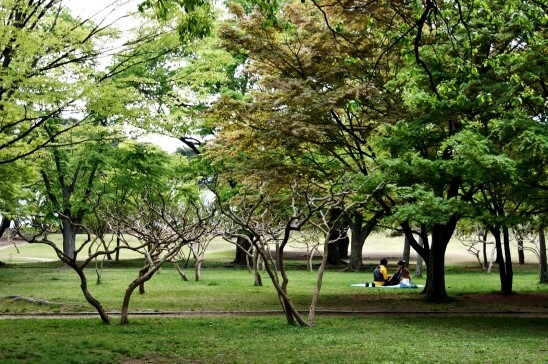 Oreung Royal Tombs Park is on the city’s recommended walking course to Samneung Royal Tombs. An unattended information kiosk has been installed at the entrance of Oreung Royal Tombs Park. Visitors can find detailed information about both the history of the tombs as well as local info for tourists (food, accommodations, other public facilities). 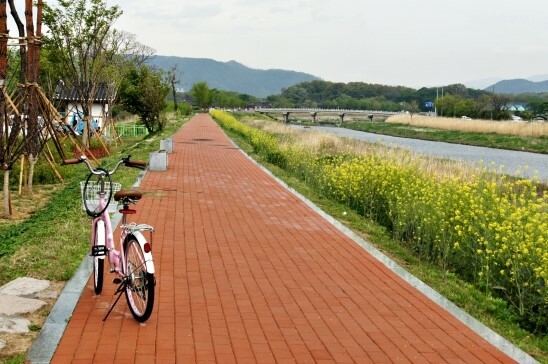 After an unhurried look at Oreung Royal Tombs Park, I headed towards the eastern historical district along the Namcheon River, retracing the path I had followed earlier. The sparse rapeseed flowers at the entrance to Woljeong-gyo bridge give a preview of the rapeseed fields at Gyeongju Wolseong. Although the interior of Woljeong-gyo covered bridge is no longer accessible to the public, there is still a PR center, and of course the exterior of the bridge is on view. Although there is a nice, wide trail leading in, try going in without your bike. Human legs are better suited to this trail than a machine. 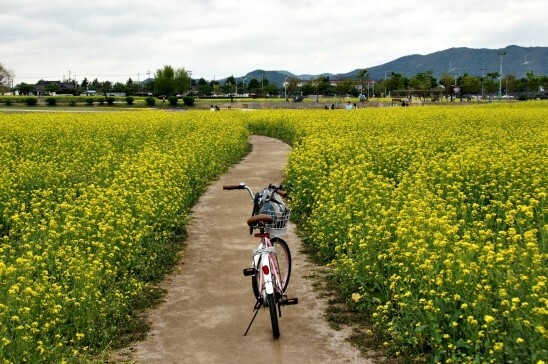 Bikes are permitted on the trail through the Wolseong rapeseed flowers. 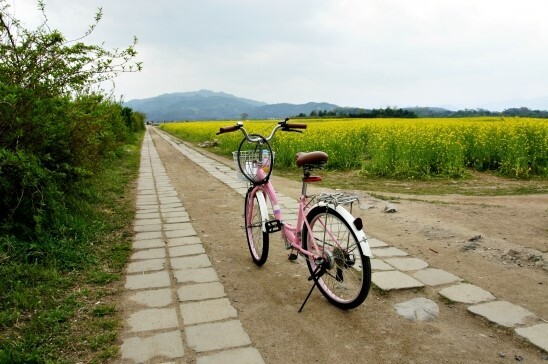 Ease the fatigue of your cycling tour surrounded by waves of bright flowers in full bloom. 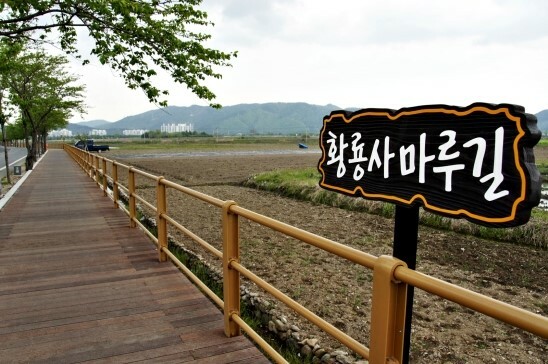 You might want to add Gyeongju National Museum and Anapji Pond (Wolji) to your course as additional points of interest before taking Hwangnyongsa maru-gil to Woljeong-gyo bridge. 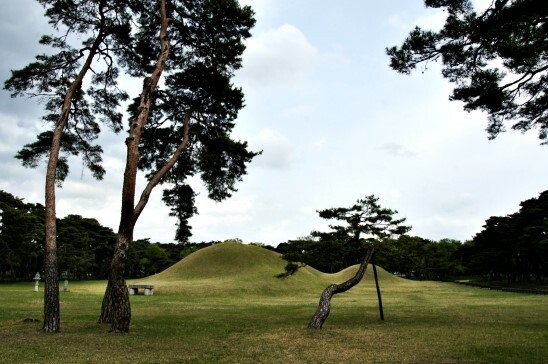 Besides Gyerim Forest and the rapeseed fields at Wolseong, the eastern historical district also contains Gyochon Village and the Silla-era astronomical observatory, Cheomseongdae. 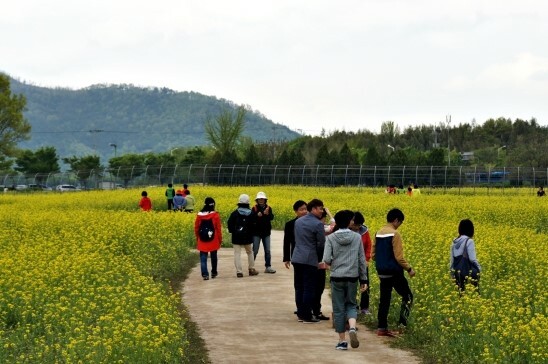 On the way back to Gyeongju railway station from the rapeseed fields at Wolseong, wouldn’t it also be nice to stop at Daereungwon Tumuli Park, where you can see Cheonmachong (Heavenly Horse Tomb)? How about a cycling tour course that you devise yourself? Visit the Gyeongju Tourguide website and follow the link in the top left corner for (My Own Personal Tour Planner’ – this feature is currently not available in the English version of the website). 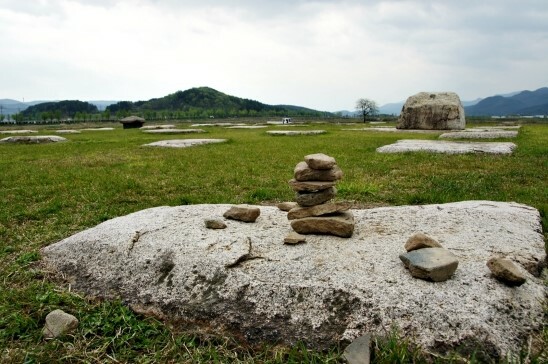 Sightseeing in Gyeongju can be more enjoyable when it begins with a well-organized plan. Thanks to provide this such nice information. you have done great work . Thank you very much! 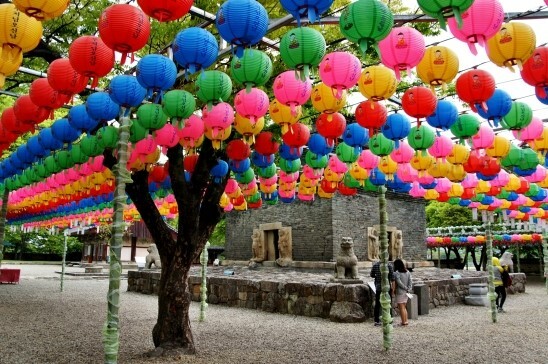 =D when you have a chance, please visit beautiful gyeongju someday.